Cupping is an ancient Chinese medicine technique also used in Egypt as far back as 3500 years ago. Cups were made from earthenware, animal horns or bamboo. Today, cups can be glass, plastic or silicone. Cups are placed on the skin, creating a vacuum seal, drawing the superficial muscle layer up into the cup. This stimulates circulation and creates a path for toxins to be drawn out and flushed through the lymphatic system. 1. Stimulates whole body relaxation. 2. Stimulates blood flow while removing debris and toxins. 3. Breaks up adhesions in the fascia and loosens tight muscles. Where there is dead, static blood, lymph, cellular debris, and toxins present in the body, Cupping can leave marks which indicates that the stagnation has been moved from the deeper tissue layers to the surface. Color can vary from light yellow to purple, depending on the suction and condition of the tissue. Marks can last from a few hours to 2 weeks. The marks are not painful. Think "hickey". Judging by the photo above, you would think cupping is torture! Not true. Actually, it is a very pleasant feeling like a gentle suction pulling away tension. Most people report feeling very relaxed afterward. Coming from a western medicine background, I have to admit I was very skeptical when I first heard about cupping. So I let someone try it on me. But only on one side of my back so I could later compare the difference. I noticed the cupped side felt significantly more released than the side that had massage only. I tried it a few more times and became hooked. Soon after, I attended my first cupping class so I could learn how to do it for my clients. 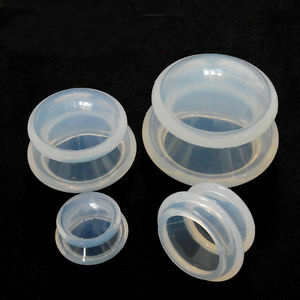 I have found cupping to be a good modality used in conjunction with massage for especially tight, stubborn areas. If you think you would like to give it a try, let me know when you come in next time. If you have questions regarding cupping, send me an email, text or call.